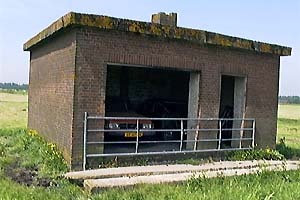 A 'garage' (G3) was used for storing some old cars. The small 'garage' (G4) sinks further and further. A Würzburg Riese antenna digitally moved to 'Seeadler'. 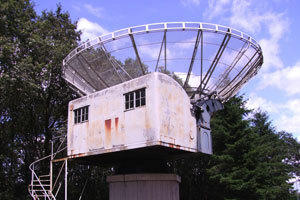 An original Würzburg Riese antenne is present at the Planetron Dwingeloo. 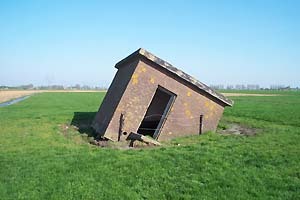 Radarstation 'Seeadler' is of special cultural-historic value and there are some reasons to be careful with its remains. First it has its value as a time picture and technological phenomena in the development of radar and air traffic control. 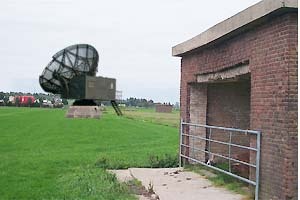 Secondly it is, despite its ruinous state and location in a densely populated area, together with Eisbär (Sondel) and Löwe (Marum), one of the best preserved and visible German radar and tracking stations in The Netherlands. And the most completer one in the province North-Holland. To our knowledge, this is also the only station in Europe with both the Wurzburg Riese socles and the Y-trackers foundations still present. Lastly this installation reminds us about a dark period in our history by which we may put our current existence in a better perspective. The radarstation can also be experienced as a monument to the air war fought above The Netherlands and in memory of those who gave their lives. Plans exist to build 2.750 more houses in the Bloemendalerpolder and the remaining area (approx. 30 hectare) a forest park. This would change the polder in a drastic way and it is unknown if and how the radarstation will be incorporated. But with these small buildings that should not be a problem. There are not many constructions made by the German occupier outside of the coastal area and even less remain. As far as we know, there is no legal protection for this radarstation. A cultural-historic report from 2010 finds the medieval waterpattern and the radarstation important for the area. It advices to use these elements for a responsible reconstruction of the Bloemendalerpolder.